Apologies to those of you who have seen this, but I just read about the growing number of Complaints Choirs worldwide, which are just what they sound like, choirs which sing a litany of complaints set to music. The genesis of the idea came from two Helsinki artists who were inspired by the Finnish expression “Valituskuoro,” which translates as “Complaints Choir,” but actually refers to the phenomenon of a bunch of people complaining about something at the same time. Taking this expression literally, under these artists’ influence, the first Complaints Choir was formed in Birmingham (UK, not USA). Since then, groups have sprung up all over the world, including in Helsinki. I think this is a fabulous idea, and I would love to join one of these choirs. Seeing as it’s nearly Thanksgiving (in the US), this may seem an odd time to promote complaining—this holiday is supposed to be about being thankful after all–but somehow singing about our common daily annoyances (which might seem particularly acute to expats) shows just how petty most of these complaints are, while still acknowledging them in a light-hearted way. To see what I mean, take a look at the video below of the Helsinki Complaints Choir in action (don’t worry if you don’t speak Finnish, there are subtitles). In the course of doing research for my latest post on Gridskipper, Algerian Patisseries in Paris, Joe and I had to sample as many delicious Algerian pastries as we could. It’s a tough job, I know, but someone’s got to do it. If you’ve never tasted Algerian pastries, I would highly recommend them. They are similar to pastries made in other North African countries (including Tunisia and Morocco) as well as the Middle East. The French refer to this whole category of sweets as patisserie orientale, and while there are basic similarities (they usually involve honey, nuts, and pastry, of course), there is a dizzying array of variations. I especially like ones involving pistachio and hazelnut, but also interesting combinations of flavors, like almond and citrus. Before we moved here, I learned that perhaps the most famous of the Algerian pastry shops in Paris, La Bague de Kenza, was located on our new street. I couldn’t wait to try their celebrated sweets, and was not disappointed when I did. For those planning a visit to Paris at some point, I would definitely suggest a trip to La Bague de Kenza. For those who want to try some Algerian pastries, without the cost of airfare, you might be interested in Les Douceurs de Kenza, a cookbook created by the co-founders of the shop (available from Amazon in France and Canada). Or you could check out this Algerian cooking blog for more recipes. Now that I have your attention, you may be wondering what the three items in the name of this post could possibly have in common. The answer: all three were subjects of recent posts I wrote for Gridskipper. My latest post is about Pétanque in Paris and includes places where you can watch games in action, grab a pint with the players, or outfit yourself to do serious boules battle. In the creepy spirit of Halloween, I wrote about where you can see dead animals on display in the post Paris Taxidermy. And finally, my post about Quick and Easy Japanese on rue Sainte Anne highlighted the rue Sainte Anne in central Paris where it’s possible to find excellent ramen restaurants and a number of Japanese grocery stores. I can’t say exactly when it was I decided that if I got married I wouldn’t change my last name, but I know that by the time I got to college the idea was pretty much confirmed in my mind. I knew a lot of people at that time who were finding creative ways to combine both last names of the couple getting married: hyphenation, a double last name for both, or a combination of two names into one word. There were even some couples who chose a completely different last name to share. While I applauded the creativity of these folks, I knew it wasn’t for me. So when Joe and I got married, I stuck to the plan and didn’t change my name (for the record, neither did he). Since then, we’ve opened joint bank accounts, signed leases together, filed joint tax returns; all the things that married couples do, and for the most part we had no problems because of our different surnames. Of course, we laughed about the insurance agent who kept sending personalized return address labels to “Elizabeth Kissell” (Elizabeth is my hardly-used first name) and even more hilariously, someone named “Liz Kissell.” Nothing about that name was mine, it was like an entirely new identity I could choose to assume if I ever needed one. While it’s by no means a universal practice in North America, a married couple having different last names is common enough that large institutions usually know how to handle the situation. As we’ve been finding out, it’s not so simple in France. It makes me wonder if that language quirk has any effect on how married couples are identified, because it’s been my experience here that institutions keep wanting to lump us together under one name. For example, our bank here issued me a bank card for our joint account with my correct name on it, but all our bank statements are addressed to “Mr. and Mrs. Joseph Kissell.” I noticed another example of this when we received our Cartes de SÃ©jour; my card not only listed my first and last names, but also my “Nom Marital,” while Joe’s card had no such addendum about the name of his spouse. I don’t mean to imply that there’s anything malicious about this, just that it chafes a bit to have a choice I’ve made undermined by social custom. And it puzzles me that a country so devoted to the cause of equality, and so dedicated to women’s welfare and rights in other areas, still clings to this convention. I think language does matter, and it may be that this practice is just the tip of the iceberg on attitudes about men and women’s roles in society. Or maybe not. I don’t know enough yet to say whether it’s just an annoying fact of life, or a sign of something systemic. And I’m very curious to know what French women themselves make of it. Is there some way to maintain a separate identity that I haven’t learned about, or is it just accepted? Perhaps there are bigger battles to fight. One of the best things about living in Paris is that we have the time to explore the not-so-obvious aspects of the city. The Eiffel Tower is hard to miss, but there are many places that are hidden, or not easily seen unless you know where to look. In my latest post on Gridskipper I run down some of the best underground sights in Paris–that is, literally under the ground. Update: Underground Sightseeing in Paris made the list of Best Maps of the Week on Gridskipper. A few evenings ago, when trying to come up with a place where we could take a walk and enjoy the fall colors, I suggested the Parc Monceau, in the elegant 8th arrondissement. I had heard that this park was well worth a visit, and had been eager to see it since we arrived. After a long Métro ride across the city, from the east to the far west, we exited the Monceau station just as dusk was approaching. We set out to do an entire circuit of the park, and stopped to admire particularly flamboyant trees or full-blown roses that smelled, as Joe said, like an artificially strong essence of themselves. We also admired the unique landscaping features built into the park—not only its tiered flower beds, but also a few more eccentric additions. We didn’t know what to make of some of them, and were a little confused about the overall theme of the park. What to think of a pint-sized pyramid near a classical Greek column? Or a miniature Japanese temple sharing the park with a Roman-style colonnade surrounding a koi-filled pond? Besides these multi-cultural elements, there were also tributes to French culture—sculptures of famous writers, such as Guy de Maupassant and Alfred de Musset. I found these sculptures not only educational, but entertaining as well. For these great men (and I only saw male writers represented), whether depicted in bust form, or as a full-size statue, each had an accompanying bevy of nubile young women (or in some cases a single admirer) swooning in worship at their feet. If I ever become a famous writer, it’s not a tribute I would appreciate, but I can’t speak for Guy and Alfred and the rest of the gang (I wonder what Colette would have made of it all). And I wonder what any of these folks would have made of some of our fellow park-goers. When we arrived, we shared the park with other walkers: nannies and their charges, well-dressed Parisians taking a shortcut to the Métro after work, and strolling seniors. We were in a relaxed state ourselves, enjoying the birdsong and the fresh air. Gradually, we were pulled out of our reverie by a few sweating interlopers galloping past us on the trail, and very soon had to abandon our leisurely walk altogether and cede the path to the hordes. We had come face to face with a new species of Parisian: the avid jogger. The promenade (a French word, please note, that has made it into English) is the only physical activity that becomes the thinker. Aristotle walked. Kant walked. The poet Rimbaud liked to go for a stroll – because it makes it easier to think, to meditate, to converse. Jogging, on the other hand, is mere body management, devoid of spirituality or sensitivity, said Finkielkraut. Comments like that are one of the reasons I moved to France. Although running has its place (as a means of escape), I have never seen the broader benefits of jogging. It’s hard on your knees, you can’t focus on the scenery as you run by, and you have to wear humiliating clothing. In addition, I’ve recently begun to question the value of strenuous exercise in maintaining one’s weight after reading this recent article in New York Magazine. Maybe these are all poor excuses, but someone has to stand up for the right to leisure, to watching the world go by at a walker’s pace. For if the French, masters (and mistresses) of the three-hour lunch and the 35-hour work week feel driven to jog, what hope do the rest of us have? You might be thinking it’s a little early to be talking about Thanksgiving, but in fact it’s not too early to talk about Canadian Thanksgiving, which is celebrated on the second Monday in October. In honor of my roots, I wrote a post for the Web site Gridskipper about Canadian-related places in my new hometown of Paris. I’m excited to be a new contributor to Gridskipper, and would be oh-so-pleased if you would check out my post. On the more general theme of thanksgiving, I am feeling extremely thankful for the opportunity I have to live in this beautiful city. This evening we took a walk down the Champs Elysées, and with the bright fall foliage and the twinkling street lights, it all seemed too lovely to be real. Of course not every day is sunshine and roses (more often grey skies and crowded streets), but almost every day I have moments of real contentment when I wouldn’t want to be anywhere else. Today is the three-month anniversary of our arrival in Paris; given that two of those were 31-day months, it’s actually day 92 for us. That’s significant, because had we come as tourists, without visas, we would have been obligated to leave the country by now. But we’ve jumped through all the necessary bureaucratic hoops to stay here legally, so as of this week we’re “really” residents in the sense that we’re doing something run-of-the-mill tourists couldn’t (or at least shouldn’t) do. And we’re celebrating by…doing completely ordinary things like making lunch, answering email, and going for a walk in our neighborhood. Ordinary things, but in an amazingly special place. On Sunday night Morgen and I had dinner at Hidden Kitchen. We left with full stomachs and warm fuzzy feelings. It was a deeply satisfying experience all around—one of the best meals I’ve had in years, plus wonderful conversation in a truly delightful setting. HK is sort of a cross between an exclusive restaurant and a private dinner party. A young American couple prepares a 10-course meal in their Paris apartment every Sunday evening for up to a dozen guests. Anyone can come, but reservations are required and there’s about a two-month wait for a spot. (We made our reservation for this week in early August.) The location is secret, sent to guests a few days ahead of time by email. A donation of 60 € is suggested to cover the cost of the food and wine. Even though HK only started in June, it has already attained a sort of cult status here, especially among the many producers and consumers of Paris expat blogs. Guests have ranged from random tourists to cookbook authors and corporate execs in town on business. I always enjoy trying a chef’s tasting menu, but this one was genuinely memorable. Each course, from the amuse bouche to the desserts and petits fours, was a work of art. I can’t come up with any criticisms whatsoever—the clever recipes, the presentation, the wines paired with each course, and the service were absolutely spot-on perfect. Given that all this was the work of just two people in a small Parisian kitchen, the effect was even more impressive. They pulled off culinary and logistical feats that put many fine restaurants to shame. But what intrigued me most, I think, was the roster of guests. The 12 of us—mostly couples who’d never met each other—sat at a long table in the dining room for four hours and chatted away like old friends. It was uncanny how easily everyone got along, even introverts like us. I’m not sure what cosmic forces induced this particular group of people to select themselves to come together for an unusual dinner in Paris on this particular night, but the vibe in the room was just right. Everyone was smart, interesting, friendly, and polite—everything you could ask for in dinner companions. After dinner, we stayed into the wee hours of the morning chatting with our hosts, Laura and Braden. They’re extremely nice people, very down-to-earth despite the unusual way they’ve chosen to spend a year or so of their lives. (Mac users too—we approve!) They told us that although the demographic of the crowd varies from one week to the next, nearly always, for unknown reasons, any given night’s guests tend to have a lot in common with each other. There’s usually a mixture of English-speaking expats and French diners, but conversation is generally in English. Nearly everyone seems to have some sort of blog connection, because that’s the main way information about HK has spread. I was shocked to learn that neither of the chefs had attended culinary school, though Braden had worked in a restaurant for a while. Even more surprising was the fact that they weren’t looking to turn this into a career (though I certainly understand not wanting to open a restaurant, regardless of how much one likes to cook). These folks have both a talent and a love for fine cooking as well as for bringing interesting people together, and Hidden Kitchen is a marvelous way to combine those passions. Over the past week or so, we’ve received a string of messages, from friends and strangers alike, wondering if we’re OK, since neither of us has posted anything new on any of our blogs in some time. It’s nice to know we’re missed! Yes, we’re both fine, and I’m in the process of writing a variety of posts detailing exactly what we’ve been up to. One reason we haven’t posted much is that we’ve both been exceptionally busy meeting a variety of deadlines for new and updated Take Control books. (As you may or may not know, I’ve written more than a dozen titles in the series, with more coming soon, and Morgen does some editorial and production work for the publisher.) In between these projects, I’ve also had to squeeze in some work for TidBITS and Macworld, and I still have a number of articles waiting to be written. Ah, the life of the freelance writer. Apart from simply being busy, though, we’ve had some other distractions. Most seriously, my dad has been in the hospital for a few weeks, has undergone major surgery and experienced various complications, and has had a couple of fairly close calls. I’ve spent many hours on the phone with family tracking his progress, and even when I haven’t actively been dealing with that crisis, it’s made it hard for me to concentrate on other things. At the moment, he seems to be on the road to recovery, but it may be some time before we have a reliable prognosis. The other significant distraction has been our ongoing immigration process. Last week we finally had our appointments at the Préfecture de Police to apply for our cartes de séjour, our long-term residence permits. Long story short: it went fine, and we’ve been told that our cards should be ready in a couple of months. But getting to that point required a ton of exhausting preparation, discussion, gathering of documentation, and anxiety. I’ll spell that all out in one or more posts here as soon as I possibly can. So that’s the scoop. We actually have found some time for a bit of sightseeing and socializing, just not time to write about it. But I’m happy to report that my Inbox is empty (always a positive sign) and although I have more deadlines ahead, I have a little bit of breathing room right now, and I’ll be getting as caught up with all our blogs as I can. One thing about Paris that really suits us is the fact that it’s such a film-friendly town. There are so many theatres, playing so many different movies (current and classic), that it’s pretty easy to find something we want to watch. Of course, we’re somewhat limited at this point to English-language movies (at least until our French gets better), but it hasn’t been too hard to find these either. The one drawback to movie-going in Paris is that ticket prices can be pretty steep. During peak hours tickets can cost over 10 euros, which is even more painful for those of us converting from US dollars. We have learned to get around this obstacle by going to morning shows (easy for us self-employed folks to do), which cost only 5 euros. We’ve also considered getting monthly passes from UGC (one of the major French movie house chains) that would reduce this cost even further. Since we are always looking for film bargains, we have been tempted by the numerous free outdoor film showings that are on offer in Paris during the summer, but the thought of trying to find a comfortable spot in the midst of a crowd has kept us away. That’s why we were delighted to find out about a program co-sponsored by the city government of Paris and the Fédération Nationale des Cinémas Français called “3 jours 3 euros” (three days, three euros). For three days every August (this year it was the 19th, 20th, and 21st), film-goers can see any film, at any time, in any theatre, for the ticket price of 3 euros. We had seen ads for this festival ahead of time, but didn’t quite understand how it worked until we lucked into it on the first day of its run. We had made plans to see the movie 2 Days in Paris last Sunday morning without knowing about the special offer, but were pleased to find our tickets only cost 3 euros. We decided that we should see a movie on each of the three days, and accomplished our goal: Hot Fuzz on Monday night, and The Good Shepherd on Tuesday. For the most part things went smoothly; however, as could be expected, crowds were much larger and shows sold out sooner (we had planned to see The Good Shepherd on Monday, but had to change our plans after the show sold out). Another wrinkle was that it wasn’t possible to reserve seats ahead of time online and still get the 3 euro price. Still, we were really happy with “3 jours 3 euros.” We were able to see three movies for less than the usual price of one ticket, and that was certainly refreshing in these humid days of August. As I mentioned a couple of weeks ago in my post Kissell on Kessel, I discovered shortly after arriving in France that there’s a street named after a famous writer and journalist whose name looks suspiciously familiar. 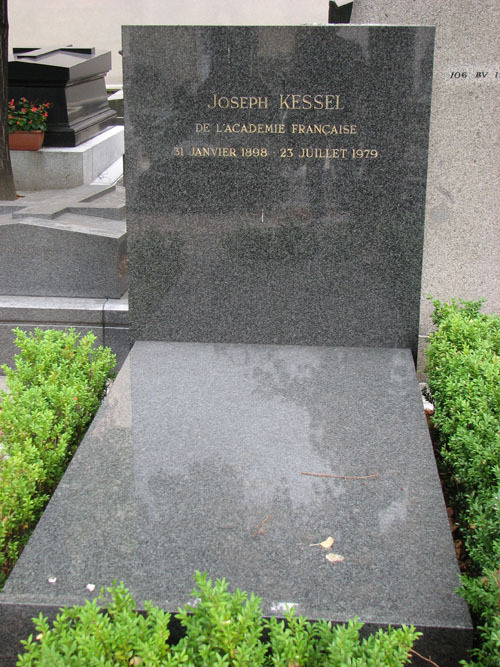 I’d been to the street, but once I read Kessel’s biography and discovered that he’s buried in the Montparnasse Cemetery, I felt compelled to visit his grave as well. It’s a simple, elegant, unassuming tomb, helpfully noted on the maps posted around the cemetery, whose other residents include Baudelaire, Simone de Beauvoir, Samuel Beckett, and André Citroën (yes, that Citroën). It’s a lovely little park, though inconveniently bisected by a city road and less tranquil than Père-Lachaise. While we were there, an interment was in progress not far away, and though I don’t believe we were close enough to disturb the mourners, I did feel rather conspicuous walking around with my camera—in jeans and a T-shirt, not black dress clothes—when something so solemn was going on nearby. If you’re in Paris this month, and haven’t yet checked out the current exhibition at the Musée de la Poste, I would strongly encourage you to see it before it ends its run on September 1st. The exhibition, titled “Avec le Facteur Cheval,” is a fascinating look at one man’s life’s work, and includes numerous examples of other artists who were inspired by his creation. Today on Interesting Thing of the Day Joe writes about the Palais Idéal, a colossal structure built by the eponymous facteur (postman), Ferdinand Cheval, over the course of thirty-three years. The exhibition at the Musée de la Poste features a large model of the completed Palais, which allows you to peer into all the nooks and crannies of Cheval’s imagination. You can visit the real Palais in Cheval’s hometown of Hauterives in southeast France, but this model is the next best thing. Visitors can also watch a black and white film from 1958 that features a discordant jazz soundtrack and the voice of a narrator reading from Cheval’s writings set over haunting images of the Palais. There are also many beautiful photos of the Palais on display, including prints by Robert Doisneau, Lucien Hervé, and Gilles Ehrmann. The rest of the exhibition is devoted to the works of other artists who were inspired by Cheval’s vision, either its eclectic style or its creative use of materials. These pieces range from oil paintings, to photography, silk screening, textured glass, delicate lace sculpture, and tableaus made entirely from sea shells. It’s fascinating to see the impact Cheval had and continues to have on contemporary artists, even as he was inspired by so many disparate sources in producing his work. The ticket to the Cheval exhibition includes free access to the museum’s permanent galleries (an overview of France’s postal system that should appeal to history and technology buffs alike), as well as to the other exhibitions currently running. I especially enjoyed “L’Angelus sonne toujours deux fois,” a collection of postal correspondence between artists Henri Cueco and Denis Fontaine inspired by the film “The Postman Always Rings Twice,” and the Jean-François Millet painting “L’Angelus.” Since 1999, Fontaine has mailed Cueco a series of over 60 objects, each bearing the image of the famous Millet painting. These objects range from a tennis racket, to decorative ceramic plates, to a soccer ball (or football as it’s known outside North America). You just have to see it to believe it, and if you are interested, make sure to get there by September 1st before it closes. Another bonus of the museum is the plethora of Éxupery-related merchandise in the gift shop. If you are a fan of Le Petit Prince, this is the place to stock up on key chains, pencils, postcards, notebooks, and even action figures bearing his likeness. Philatelists interested in French stamps can also find some interesting specimens at the Point Philatélie in the museum. Although I highly recommend a visit to the Musée de la Poste, be aware that it is not set up for non-French speakers. I’m sure it’s possible to visit and have an enjoyable time even if you can’t understand the signs or explanations of the exhibits, but knowing a bit of French definitely helps. 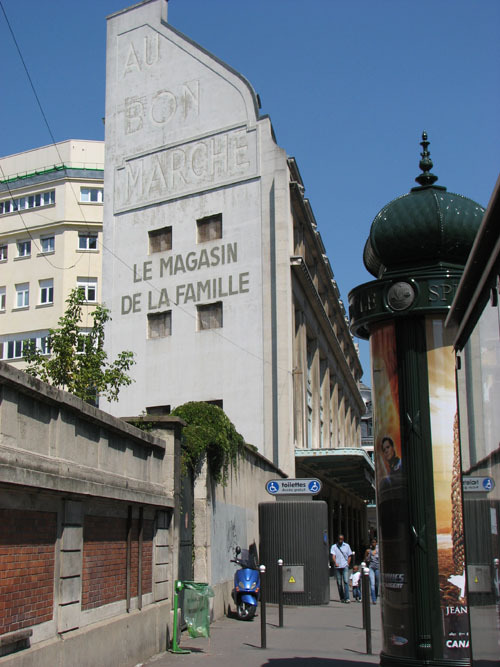 The Musée de la Poste is located at 34, Boulevard de Vaugirard, on the eastern side of the Gare Montparnasse. The closest Métro is Montparnasse-Bienvenüe. One of my favorite memories of previous visits to Paris was the first time I visited Notre Dame. Upon entering the dim, cavernous cathedral, I was awed by the incredible height of its arched ceiling, which seemed to expand upwards infinitely. The quality of the light coming in through the intricate stained glass windows was magical, and I felt a deep sense of comfort and peace. Despite the presence of many people, a reverential silence prevailed, and I felt as if I had stepped back in time, walking where so many thousands had before. Wanting to experience that type of atmosphere again, last Monday Joe and I made our first visit to Notre Dame since our arrival in July. I thought we might have a better chance of avoiding the tourist crowds because it was a weekday and it was threatening to rain, but my predictions turned out to be wrong. We joined a long line of tourists stretching almost across the parvis (square) in front of the cathedral, and waited our turn to enter. Thankfully, the line moved quite briskly, and once inside, I was again impressed by the size and beauty of the sanctuary, but something was different. Instead of a crowd that seemed dwarfed by the scale of the cathedral, it was just the opposite. Low murmurs were replaced by louder voices, and it was difficult to navigate through the crowds clustered at various points in the cathedral. There also seemed to be many more cameras in use; not just constantly-flashing still cameras, but more sophisticated-looking video cameras. Before we moved to Paris I had a list of places I wanted to visit when we got here, and La Grande Épicerie was very close to the top of the list. I had read about this food emporium, part of Le Bon Marché department store, on various Paris-based blogs, and was eager to see it for myself, especially since after reading these posts, and checking out its official Web site, I still wasn’t sure what to expect once I actually got there. In the absence of first-hand information, I imagined it to be similar to the Food Hall in the London department store Harrods, which we’d visited a few years ago and thoroughly enjoyed. The Food Hall consisted of a series of elaborate rooms showcasing various pricey and delicious foodstuffs. It reminded me somewhat of the British Museum (also visited on the trip) in that it contained all sorts of treasures brought from the ends of the earth. I felt as if I were visiting a museum too, as we admired bright exotic fruits like they were the Crown Jewels. It was a fascinating experience, but I never imagined that mere mortals like us would make a regular habit of buying groceries there if we happened to live in the neighborhood. I expected La Grande Épicerie to be the same—a boutique of fascinating foods that one might nibble on daintily, not a place to satisfy one’s appetite. I couldn’t have been more wrong. In fact, we found La Grande Épicerie to be the exact opposite of the gosh-that-jar-of-olives-costs-more-than-our-monthly-food-budget type of place; compared to our local supermarket, the prices ranged from the same to dramatically lower. Of course, it does sell designer concoctions from high-brow producers like Fauchon and Hédiard, but on the next shelf over from those, you can find much humbler fare, like mini marshmallows that would not be out of place in a middle American supermarket. Yes, these were in the “American” section, and cost more than they would have in the US, but it warmed our hearts that haute cuisine could co-exist with comfort foods. Like our own, the store’s tastes ran from gourmet to granola. We became giddy looking at all the products we had been unable to locate in other stores over the previous month. Swiffer! Irish oatmeal! Baking soda! It was worth the trip just to find these curiously rare items. I had been gathering ingredients to make pancakes since we arrived in Paris, and had everything (including the maple syrup) except baking powder. I found it at La Grande Épicerie. However, lest you think that we are reverting back to North American ways and ignoring the delights of French cuisine, I can attest to our even greater excitement when confronted with the array of traditional French foods available to us. Just the sight of a case full of cheese in various states of decomposition made me swoon (maybe it was the fumes). Who knew that cheese could come in such vivid colors? Joe became transfixed by the selection of milk products on display; I’ve heard they even sell horse milk although we didn’t see it at the time. Bread, sausage, olives, herbs, chocolate—we hadn’t seen such a wide variety of all these in a long time. And the best part, at least for me, was that we could browse to our heart’s content without coming under the watchful eye of the staff, as we’d experienced in smaller stores all too often. Perhaps this was what was so appealing, that we could have access to traditional French artisan products in the familiar setting of a supermarket. Maybe some day when our French improves, it won’t be so daunting to carry on a five-minute conversation with the local baker about what he or she might recommend, but for now it was lovely just to look, and to imagine all the culinary adventures ahead of us. A note on the photo: This is the side view of the building that houses La Grande Ã‰picerie. We were amused to see that fellow Paris blogger Polly Vous Francais? posted a very similar photo on her blog today.